← Tom Harris, Heartland and the 2007 Bali open letter to the U.N. Readers are no doubt be aware of dubious scholarship in the infamous 2006 Wegman Republican-commissioned report on paleoclimatology (not to mention shoddy analysis) and a follow-up 2008 article in Computational Statistics and Data Analysis by Said, Wegman and two others (retracted last year). Those two works were the subject of contradictory decisions in recently concluded misconduct proceedings at George Mason University. (Weirdly, even though the CSDA paper was retracted last year, and the plagiarism finding was upheld by GMU, the paper is still listed in Wegman’s recent publications as if nothing has happened). “Color Theory and Design” (2011): Discussion part 1 & part 2 with side-by-side analysis. “Roadmap for Optimization” (2009): Discussion and side-by-side analysis. Both papers were the subject of separately filed complaints to Wiley within a short time of the discovery of apparent plagiarism. The complaint timelines are outlined in John Mashey’s just-released study of various investigations at GMU, See No Evil at George Mason University (see section 5.2 on page 25 of the full report). Mashey’s chronology also makes clear that little substantive response has been received from Wiley, leaving the impression that no action had been taken. But in each case, the complaint was apparently handled by allowing a complete”redo” of the questionable paper that removed all traces of plagiarism and, in the case of “Roadmap” added dozens of new citations, as well as many references. In the two following sections, I’ll briefly describe the chronology of events for each paper, and give examples of some of the wholesale changes made in attempted remediation. Then in the concluding section, I will look at the troubling issues raised by this sorry episode, and point at some tentative recommendations for resolving the resulting fiasco. 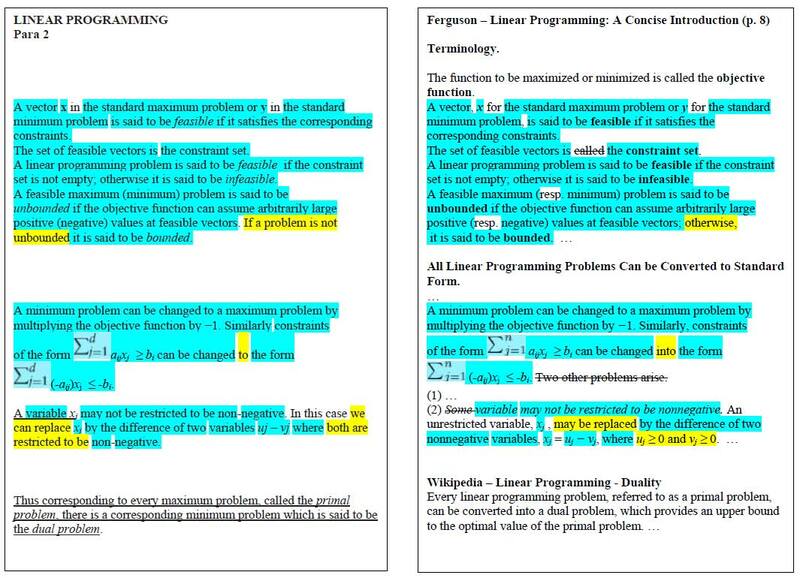 Two days later, John Mashey filed a complaint to Wiley pointing to my initial discussion, as well as to my detailed paragraph-by-paragraph analysis (snapshot below, showing identical text from unattributed antecedents in cyan, and trivial changes in yellow). 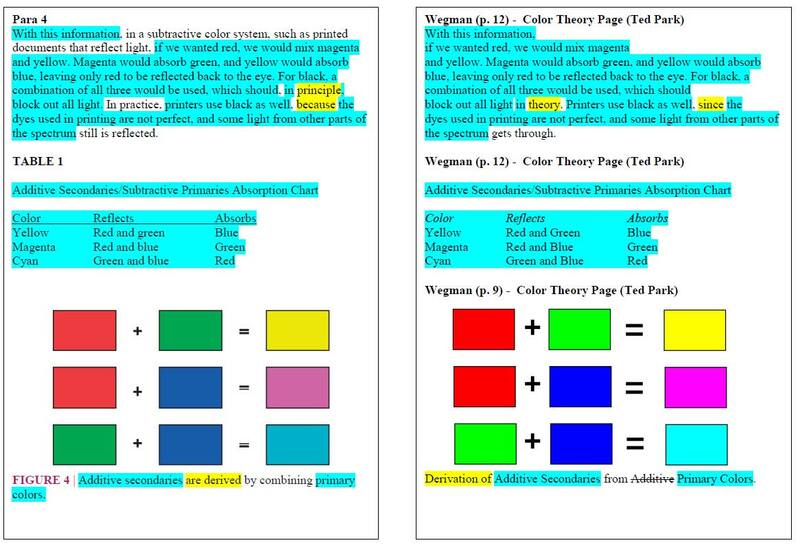 In this case, a paragraph, a table and a chart of secondary primaries were copied from an obscure (and no longer existing) web page by Ted Park into Wegman’s 2002 color theory lecture, and from there to the 2011 article with very little change. Similarly, other passages from this and two other websites found their way into the article via Wegman’s color theory lecture, augmented by unattributed passages and diagrams from Wikipedia. Some latter passages in “Color Theory and Design” did acknowledge generally Marc Green’s work (which is still available on the internet), but even here there were several unacknowledged block quotes and lightly paraphrased passages; unattributed antecedents were discovered on 13 pages of the 15 page article. This pattern strongly suggests that these are not bona fide references, and are simply padding and obfuscation. Meanwhile, of course, the real Wikipedia sources are unacknowledged. Over the ensuing months, Mashey received little substantive response from Wiley concerning these well documented problems. But behind the scenes, something was going on. As I discovered two weeks ago , at some point it was decided by Wiley and the WIREs CS team to solve the problem by mandating a complete rewrite of the article. This article, first published online on February 4, 2011 in Wiley Online Library (http://www.wileyonlinelibrary.com), has been revised at the request of the Editors-in-Chief and the Publisher. References and links have been added to aid the reader interested in following up on any technique. All of the obviously copied material has either been removed, revised or (in the case of several diagrams) finally attributed. For example, the above passage and the diagram from Ted Park have both been removed, while the table has been reformatted and attributed. Of course, attribution to an old website is itself curious; in this case, the only choice is Ted Park’s website at Beer.org as stored at Archive.org, certainly a fairly unique reference in a scholarly journal. Park T. 2001. Available at: http://replay.waybackmachine.org/20011217234921/http:/www.beer.org/∼tpark/color.html. (Accessed April 19, 2011). This also suggests that the revision may have been underway as early as April of last year (just weeks after my original post). However, the “creation date” of the current PDF version of the article is dated December 2011, so the exact timeline of revision and acceptance by Wiley is very imprecise. Anyway, I’ve checked a few other “cyan” passages, and they all show a similar pattern. scientific, and data visualization”, the subject of the article remains inexpertly explained and sourced. Moreover, the elderly have difficulty discriminating colors which differ primarily in their blue content: blue-white, blue-gray, green-blue green, red-purple, etc. Wegman and Said’s mangled rendition renamed the difficult-to-distingush pairs (e.g red vs purple) into mixed color descriptions (e.g. magenta is a mix of red and purple)! Thus, the original point was completely obscured. Of course, colors that have a blue component will shift in the perception of the elderly so that cyan, blue-gray, light blue, magenta will be affected and more difficult to distinguish. This wrongly implies that the elderly will have difficulty distinguishing light blue, say, from magenta. The revised version is not much better, despite the dropping of the final phrase. Of course, colors that have a blue component will shift in the perception of the elderly so that cyan, blue-gray, light blue, magenta will be affected. The acknowledgments have seen an important change as well. The original stated the article was based on previous lectures, but only acknowledged the one still existing antecedent (out of five or six). This article is based on lectures given by one of us (E.J.W.) in graduate courses in Statistical Data Mining and in Scientific and Statistical Visualization. Much of the discussion in the Section on Color Deficiencies in Human Vision and the Subsection on Hard-Wired Perception is based on material in Green (2004). The inspiration of Marc Green is hereby gratefully acknowledged. Now this has been revised in order to remove any reference to the problematic lectures. As with any overview article, this discussion was synthesized from many sources including the cited Wikipedia articles. Early discussion in the sections on Human Visual System and Color Theory were based on Park and Eastman Kodak which are now no longer directly accessible. Much of the discussion in the section on ‘Color Deficiencies in Human Vision’ and the subsection on ‘Hardwired Perception’ is based on material in Green. The inspiration of Marc Green is hereby gratefully acknowledged. Thus, the true main antecedents have now finally be acknowledged, but the new version leaves the reader clueless as to why such old and ephemeral sources were used in the first place. In the case of the flagship “Roadmap” article (the very first article to appear in WIREs CS at its launch 2009), the chronology is much more complex. Not long after I published my analysis of “Color Theory and Design”, I was advised by SFU professor Ted Kirkpatrick that the “Roadmap” article contained similar problems. According to him, a key passage on the simplex method was derived from Wikipedia (an assertion easily confirmed) and that at least one or two other passages were suspect, not to mention incorrect. A few days later, Kirkpatrick advised me that he had decided to launch a complaint to Wiley based on his preliminary analysis, at which point we terminated discussion of the matter. I now have found out that John Mashey had advised Wiley of this development in late April 2011, followed by the more extensive communication from Ted himself a couple of weeks later. Meanwhile, I launched my own independent examination of “Roadmap” (after kicking myself for not paying heed to a comment months earlier from “Amoeba”, who pointed out that the article opening appeared to come from Wikipedia). It was not until October 2011 that I posted my discussion and analysis, as summarized at the time. Unattributed antecedents were summarized in the following table (as found on p.3 in the complete analysis document Suboptimal Scholarship: Antecedents of Said and Wegman 2009). As can be seen, all sections were derived at least in part from unattributed antecedents, and the first eight pages were almost all derivative. 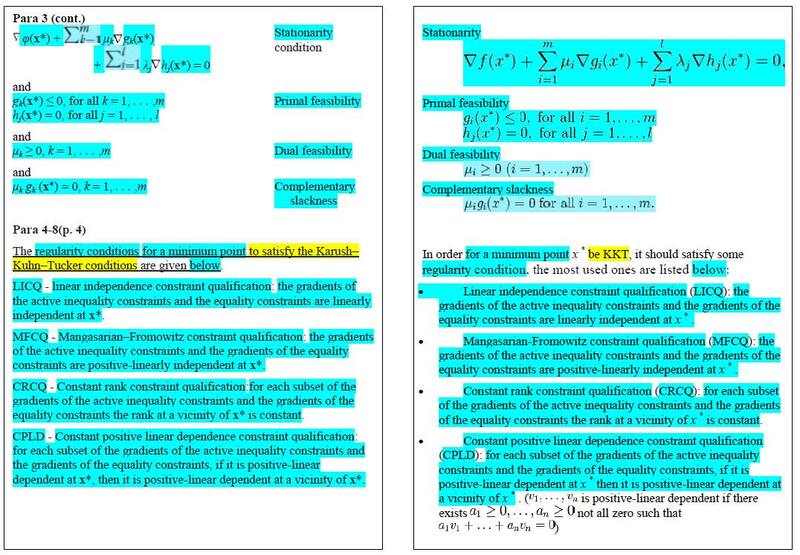 Here are two of the most extreme examples, once again with copied material in cyan and trivially edited in yellow. The first shows a comparison of the section on Kusher-Kuhn-Tucker conditions and the corresponding part of the Wikipedia article on KKT (Suboptimal Scholarship, p. 14). The second example is on linear programming, much of which came from an online article by Tom Ferguson (Suboptimal Scholarship, p. 21). Thirteen egregious errors were also identified, nine of which were introduced by mistranscription or else misunderstanding of the lightly edited copied material (see p. 4-5 of Suboptimal Scholarship). My original post discussed three of these in detail, including the infamous “2d (or, not 2d) ” howler where the Wikipedia superscript was apparently rendered as a regular character. … the simplex method visits all 2d vertices before arriving at the optimal vertex. the simplex method … visits all 2n vertices before arriving at the optimal vertex. And all this time I thought a cube had eight vertices, not six. Who knew! Once again, a recent visit to WIREs CS revealed wholesale changes to the original “Roadmap” article. This article, first published online on July 13, 2009 in Wiley Online Library(http://www.wileyonlinelibrary.com), has been revised at the request of the Editors-in-Chief and the Publisher. References and links have been added to aidthe reader interested in following up on any technique. This article focuses broadly on the area known as optimization. The intent is to provide in broad brush strokes a perspective on the area in order to orient the reader to more detailed treatments of specific subdisciplines of optimization throughout WIREs: Computational Statistics. In this articlewe provide background on mathematical programming, Lagrange multipliers, Karush-Kuhn-Tucker Conditions, numerical optimization methods, linear programming, dynamic programming, the calculus of variations, and metaheuristic algorithms. This article is intended as a broad overview of optimization.While often considered as a subset of operations research, optimization is a central concept for statistical theory, e.g., maximum likelihood, least squares, minimum entropy, minimum loss and risk, and so on. As data set sizes become larger, the computational framework of optimization becomes more important. 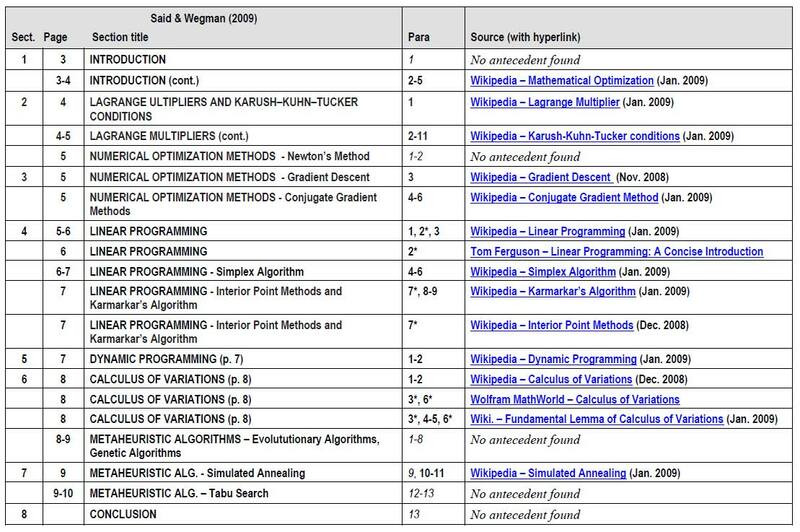 In this article we cover mathematical programming, linear programming, dynamic programming, calculus of variations, and metaheuristic methods. This appears to be an attempt to justify the treatment of optimization within the rubric of computational statistics. It is still not clear, however, whether all of the optimization methods discussed have much applicability to statistics , although certainly some do. The article itself has been almost completely rewritten. The most egregious cases of block copying have either been removed altogether (e.g. Tom Ferguson on the simplex method), or greatly reduced and referenced (e.g. Table 1 on KKT conditions). The latter has been reformatted, with the corresponding Wikipedia reference cited a at the beginning of the section, along with three others (though the actual antecedent is still clearly Wikipedia). Indeed, the number of citations has grown from a mere seven to more than a hundred, including all the previously missing Wikipedia references! As for the obvious errors, the ones I checked have been more or less fixed, or else avoided altogether. In general, though, the article is still somewhat vacuous and aimless. The timing of the revision shows a similar pattern to that of “Color”. All online references (mainly Wikipedia and WolframMathWorld) were accessed on July 27, 2011. However, as in the case of “Color”, the published PDF is dated December 2011, so again the intervening timeline is unclear. As with any overview article, this discussion was synthesized from many sources including the cited Wikipedia and Mathematica articles. There is no intent in this article to claim that this article represents original research work on our part, but this article is offered with the intent of providing the Roadmap to the field. We are grateful to the two external referees who reviewed this article and whose suggestions have much improved the discussion. It’s certainly true that “any overview article” would be “synthesized from many sources”. However, I very much doubt that Wikipedia is commonly cited in such articles. And the massive copy-and-paste previously in evidence can not simply be waved away by the assertion that “[T]here is no intent in this article to claim that this article represents original research work on our part”. Even more interesting, though, is the reference to external referees. Since the article is so greatly changed, presumably they reviewed the revised version, not the original, leading to questions about the original process in place at WIREs CS. And with that, I will now move on to the editorial process at WIREs CS, including the handling misconduct complaints. It should be clear at the outset that the editorial process relies on clear separation between the roles of editor and author. Although perhaps not the norm, it certainly is not extremely exceptional for editors of specialized journals to also write in those journals. However, there is always an implicit or explicit expectation that in such cases, the articles will be overseen by another editor. In the case of WIREs CS, the only other available editor was David Scott, and so I have presumed that he must have overseen the original articles by Wegman and Said, and led the subsequent complaint procedure. Aside from the copy-and-paste problems, my original analyses showed errors and generally shoddy scholarship, accompanied by a poor understanding of the subject area. The original peer review of these articles failed to find even those problems, leading to the inevitable conclusion that either Scott’s choice of peer reviewers was wholly inadequate, or that the articles were not peer reviewed at all. The handling of the two plagiarism complaints by Scott and Wiley was inexcusable, especially given Wiley’s comprehensive ethics policy. 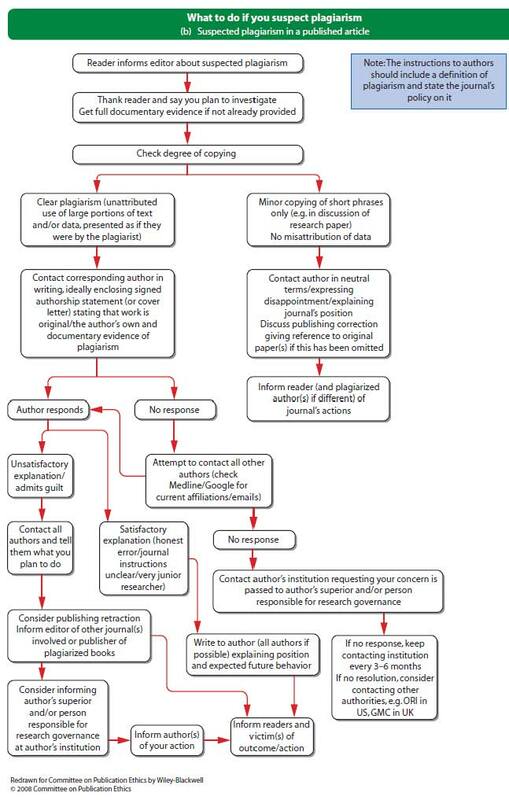 Here is the process laid out by Wiley for the handling of plagiarism complaints concerning previously published work (with original flow chart found here). The first thing to notice is that Wiley recommends that instructions to authors should include a “definition of plagiarism and the journal’s policy on it”. The WIREs CS author guide contains nothing on the subject, although this appears to be true of all the WIREs journals. The first check point of interest is “Check degree of copying”. Here there are two possible responses: “Clear plagiarism” and “minor copying of short phrases”. As we have seen above, the evidence is overwhelmingly in favour of the first; were this not the case, massive revisions would not have been necessary to remove all evidence of copy-and-paste material, and the matter could have been handled by “publishing correction giving reference to original paper(s)”. Of the three bases for “satisfactory explanation” the only one that can possibly obtain is “honest error” (given the involvement of two of the journal’s own editors). But, here again, the weight of the sheer magnitude of copying, the addition of deliberate slight edits and the failure to attribute almost all of the actual sources makes this explanation a non-starter. The only way that this pattern can possibly be ascribed to “honest error” is if Wegman and Said truly do not understand the very concept of plagiarism. This level of delusion can not be ruled out, but nor can it be reasonably anticipated or accommodated by a research misconduct policy. Write to author (all authors if possible) explaining position and expected future behaviour. Inform readers/victim(s) of outcome and action. So even if, against all logic and evidence, Wiley arrived at a finding of “honest error”, the mandated information to readers was not provided. Inform editors other journal(s) involved or publisher of plagiarized books. Consider informing author’s superior and/or person responsible for research governance at author’s institution. There is no possible justification in any of the above for the course actually chosen by Wiley, which was to mandate massive revisions that in effect allowed all hint of plagiarism to be covered up, with no admission of problems. And a particularly disturbing aspect is the statement that the two revisions came at the request of all three editors in chief (in the plural). This could be interpreted to mean that Scott and Wiley improperly allowed Wegman and Said to play some role in the decision making process. If so, that was clearly unacceptable and an egregious conflict of interest. It is now crystal clear that the research misconduct procedures went seriously awry at Wiley. The only possible response is to have an outside review of the whole matter, excluding the three WIREs CS editors and anyone else from Wiley who may have been involved in the original plagiarism response. As for David Scott, he has clearly failed to exercise proper oversight on the work of Wegman and Said. An offer to resign from WIREs CS should not be out of the question. It also high time for David Scott to take some responsibility with regard to the Wegman Report. Rumour has it that his involvement may have been minimal. If he had nothing to do with the copy-and-paste scholarship of the background portions (see analysis 1, 2, 3, 4) or supplementary sections of the report, about 35 pages in all, or the incompetent and biased analysis, he should do the honourable thing. David Scott should remove his name from the list of authors and disavow the Wegman Report once and for all. This entry was posted in Climate science disinformation and tagged David Scott. Wegman report, Edward Wegman, WIREs Comp Stat, Yasmin Said. Bookmark the permalink. These people have no shame, and the American people are so dumbed down by the media they know they can get away with this stuff easily. Not even bringing it to our attention is going the change things here. They know they can rewrite history any way they want and America will swallow it. Makes rather a mockery of citations for unwary authors leaning on Wegman & Said. How are readers supposed to tell which version is being cited? Doesn’t this sort of invisible morphing of previously published work make WIREs CS pretty much useless as a research resource? On the other hand, neither article has even a single citation as yet, according to Google Scholar. Perhaps other WIREs CS articles have fared better. WIREs:CS seems a weird mix of decent articles written by people who know their subject and ones marginal in various ways. That’s really too bad for people who contributed decent articles to a journal whose reputation will suffer, assuming ti continues to exist. For instance, there is “Statistical methods for computer performance evaluation,”, a nice article by Shruti Patil and David L. Lilja, in an area I know something about. It’s exactly what you’d want for a review article. I’ve referenced Lilja’s textbook on the topic. I did find it interesting that number of people on Editorial Advisory Board has dropped from 11 to 6. The audience most affected in this case are academics. They tend to pay more attention to this stuff, recognize it when it happens, and take it seriously. It’s just that the process is slow and important parts of it happen altogether out of the public eye. For example, even without any further sanctions from GMU, Ph.D.s supervised by Ed Wegman are going to have a tougher time on the job market. Just one person on the hiring committee has to know this story. The hiring difficulty in turn will reduce the number of students applying to study under Wegman. Slow consequences but real ones. > Ph.D.s supervised by Ed Wegman are going to have a tougher time on the job market. Wasn’t he taken off supervising Ph.D’s? But yes, more generally folks are going to think twice before hiring anyone with a GMU background, or even risking collaborating with them. Wasn’t he taken off supervising Ph.D’s? According to his Facebook page, he was limited to co-supervising doctoral students. That was likely just for the duration of the investigation. Given that the only sanction reportedly assigned to Wegman was a letter of reprimand (and “retraction” of an already-retracted article), I’m assuming he’s free to supervise independently now. I’m amazed that anyone can put actual words together to comment on this. The whole purpose of peer review is to ensure papers are credible, if not entirely free of error. Other academics and inexpert outsiders like me can only despise the action by Wiley in this case, as it brings the edifice of peer review into question. It is good that the light is being shone on this sorry tale. Shame, Wiley, shame. I’ve drafted out a letter template that academics could send to Wiley journals to seek assurance as to their academic quality controls. I’m happy to share this around. I suppose it’s not plagiarism to send in a form letter! I’ve remarked on this before, but I’ll say it again. In any institution where I have worked, if any first year undergraduate submitted – even as a simple lab report – material of this standard, it would have been failed. Moreover, they would have received a formal warning for the plagiarism involved, after which any further instances would require strong justification not to discontinue their enrolment. A simple skimming of most institutions’ plagiarism policies would probably show similar standards. It staggers me that Wegman and his students retain their positions, even after the consistently appalling lack of academic rigour that they demonstrate. It seems to be absolute proof of the aphorism that it’s not what you know, but who you know. Ironically, GMU’s Writing Center has a well-written page on plagiarism. 2) Other professors of similar level. Given similar plagiarism, how would the 3 groups be treated? Of the two answers “the same” or “others woudl be treated much more harshly”, both have problems. But if the treatment of Wegman is as unusual as it seems, I’ve proposed on p.28 of See No Evil 4 hypotheses. Obviously I don’t know. Indeed, this Wiley stuff is nonsense, but let’s not expend too much time and energy on putting pressure on Wiley — lest we lose sight of the even more important piece of nonsense that is the Wegman Report. From the GMU’s contradictory response, it should be clear that the denialists are circling their wagons around the Wegman Report. If the authorship of the Wegman Report is found to involve misconduct, then the fallout will be of epic proportions. And when that happens, who knows, maybe even Wiley’s David Scott will start to get the message. Yes, the Wegman report has bigger political potential, but the Wiley nonsense has the capacity to wake up academics. Few of them realize the systematic threat denialist tactics pose to all scholarship. Wider publicity of this might get some more fighting mad, get them to participate more. Although this wouldn’t be the first time my idealism has led me to unrealistic predictions. Who owns Wiley? Hmmm, seems the family still has influence. Nothing on sourcewatch. I’d like to say that I’m surprised but the last 2 papers I’ve reviewed have included levels of cut-and-pasting that is worrying. When we run all our student’s assignments through TurnItIn to catch this sort of thing I really don’t understand why journals don’t do the same with their submissions. run the original articles through TurnItIn and see what they say. Remember, the well-established plagiarism style here starts with copy and paste, then makes a bunch of trivial edits. With enough trivial edits people can defeat simpler plagiarism checkers, and I’ve read that students have learned to do that, especially if they know the checker that will be used. Needless to say, academic readers especially are encouraged to mention this mess to colleagues, Wiley, etc. Also, give credit to Elsevier for driving the CSDA retraction over resistance by EiC Azen. That leaves Springer, who will be due some attention sometime, I expect. John, typically, as we have also seen with the various plagiarism issues with Wegman et al, “trivial edits” are not that trivial: they can change the meaning. A proper way to refer to text in the original vs. the revised paper, for academic purposes, is needed for the original to be distinguished. Hank, one might need to introduce some conventions that are now used when citing web pages. Say, write something like “such and such an article, retrieved at such and such a date and time“. I see Wiley as potentially the loose thread that makes the whole cloth unravel, right back to the Wegman report. There are enough academics who care about this to really get something started at Wiley. Slightly facecious but it probably would work if, like me ,you usually use (Author, Date) citations. Perhaps we could also use WEG2001–first.rev Weg2011–second.rev, and so on. I know that one must be a “citizen of the Commonwealth of Virginia” in order to make an inquiry under the Virginia Freedom of Information Act–or a journalist whose publication (presumably the paper kind) must be circulated in Virginia. Quaint, that last part.. Not so for the equivalent California Public Records Act. As usual, great work DC. As to the whole Wegman, et. al., Wiley and GMU quagmire to date, I’ll borrow a few headline quotes from WTFUWT? 1) GMU certainly did not try to reject Bradley’s complaints on out-of-state grounds. As noted in <a href="http://www.desmogblog.com/see-no-evil-george-mason-university"See No Evil, several people sent complaints of the that ended up covering the rest. For instance, see p.15, Rob Coleman’s complaint about PhD dissertations. However, universities may well apply penalties to complainants inside who do not try to maintain confidentiality. 3) Regarding VA FOIA, by odd coincidence, I bookmarked VA FOIA quite a while ago, and top of p.5 is the relevant statement. Put another way, that doesn’t guarantee that an out-of-stater cannot ask, but they don’t have to tell if they don’t want to. Of course, if one happens to know VA residents or relevant journalists, no problem. For example, Strange Tales and Emails pp.16-17 mentioned my attempt to use FOIA with GMU. There are however, potential FOIAs still to be done, such as to NSWC. Over at Rabbet’s, lawyer Brian Schmidt discusses the copyright issue. His original post indicated that text from Wikipedia wasn’t really protected by copyright (or Wikipedia maintains no copyrights). I pointed out that the content of the articles is dual-licensed with Creative Commons and/or GNU Free Document Licenses that require certain things for re-use, like attribution, indication of changes, and copylefting. It doesn’t seem as though the Wegman and Said papers adhere to these terms. The obvious question is, what happens next? Is Wiley being notified that one of is journals is going against their plagiarism guidelines, that the EiCs have apparently violated copyrights, and that they may be circumventing the proper peer-review process for their journal? Is GMU going to be notified of these incidents in another formal complaint? Should we wait for Wiley to take action/respond to the WIREs CS issue so that GMU has an outside decision to guide their investigation? The 2011 paper was originally published well after Wegman was being charged with plagiarism in the Report and W&S 2008. I imagine it’ll be more difficult for even a tenured professor to get away with a second slap on the wrist. The copyright issue is a red herring in my opinion. As you point out, Wikipedia material is covered by copyright in general (contributors of images can select exactly which license they want to use). As I detailed in part 2 of my original coverage of “Color Theory”, Wegman and Said cited the general form of license for each image (which was a clue to the Wikipedia source), but did not actually attribute the images or state the source. In other words, they attempted to fulfil copyright obligations without attribution, which is impossible. From a Wikipedia perspective usually attribution (via link or URL) is normally both a sufficient *and* necessary condition of the copyright, whereas pointing to the actual general license is neither! WheelsOC, the way to pursue copyright violation is to get the copyright holders themselves to seek legal redress against Wiley. I think for Wikipedia text and artwork, copyright remains with the original authors; for academic articles, copyright is probably transferred to the owners of the journal (but some journals may differ…). It may also be interesting to see if one can bring a copyright violation charge against the authorship of the Wegman Report. If there hadn’t been any precedents for such a situation, this may make an interesting test case. As discussed in See No Evil p.4, by 06/06/11, GMU was informed of the whole collection, EXCEPT the details of Said & Wegman (2009), i.e., there was a tag there, but the details were not as yet public. That was to give Wiley a fair chance to deal with it, but of course, had GMU asked, they would have been given what WIley had been sent. See also p.22, p.25, p.35-37. One of the reasons I haven’t gone much into the copyright turf is that the copyright holder has to pursue it, whereas anyone can lodge a plagiarism complaint. For a lot of the copyright holders, it may not be worth the bother, and with Wikipedia, I’m not sure who would actually do it. Of course, if people recall from p.9 of Strange Inquiries @ GMU a year ago, it seemed GMU only started to wake up after Elsevier’s John Fedor started pushing on them. That might be real, might be a coincidence of timing. By far the most likely potential copyright litigant would be Wolfram Research. But even there, it’s unlikely they would bother. I looked at the online vernon of the student newspaper at GMU, Broadside. I entered “Wegman” as a search term and got bupkis. I thought maybe a letter to Broadside along the lines of John Mashey’s hypothetical about consequences for students of plagiarism, citing the GMU Writing Center standards. But if the students don’t know about l’affaire Wegman, how can they be outraged? In other news, the outgoing Rector (Chair) of the GMU Board of Viistors (Trustees) didn’t seem to think it was out of line that the Board didn’t see fit to even introduce the finalists for President of GMU to the faculty. (That the glacial pace and final release of the investigation coincided with the end of the reign of outgoing GMU President Merten may not be a coincidence. Playing out the clock is a tried-and-true strategy, after all.) The faculty’s nose is out of joint. And they will be getting a new provost as well. So perhaps outgoing provost Peter Stearns was trying to burnish his credentials as a reliable ‘team player’ by his cover-up, oops I mean statesmanlike handling of the whole mess. It might help in his job search. I somewhat think that people with extra cash should enroll at GMU just to demonstrate what a new interpretation of plagiarism would look like. Right now I’m imagining Paris Hilton getting her degree through plagiarism, and all the publicity that would generate. Sorry, must be the green beer. Peter N Stearns friend-ed Wegman on facebook. David G: I did put a note on Connect2Mason, also a student effort. Student newspapers vary in the ability to contradict the administrations. I have in the past occasionally sent LtE’s to Broadside, you might try that. Many thanks to John Mashey and DeepClimate. They have read the articles “written” by Wegman and Said very thoroughly – much more thoroughly than the alleged authors W&S. Well, credit DC first, but also, thanks to Ted Kirkpatrick on the optimization article, and as DC notes, “amoeba” actually mentioned it way earlier. I missed it also..
DC did the huge amount of work, but it was also a community effort. People might want to explore COPE – Committee on Publication Ethics. Although he did not graduate (from anywhere), another famous guy spent at least some time at GMU …Karl Rove. One more useful item to read is DHHS rules, specifically p.26 of the PDF (labeled p.28394), section 93.413 HHS compliance rules. I.e., things ORI might do if an institution appears unable to do what it needs to. In See No Evil p.4 ORI is directly relevant to items [n] and [s], in which Said thanked the same NIAAA contract. You might ask why the National Institute on Alcohol Abuse and Alcoholism and Army agencies were funding this work. You might also see on the same page of the ORI document, 93.408. I strongly recommend Self-Plagiarism or Fair use?, a 5-pager from CACM in 1994, by Pam Samuelson, i.e., a serious expert on interactions of plagiarism and copyright. At what point in his career did Wegman become a phony? Here’s a good starting point. I would argue the arrival of Yasmin Said at GMU is an inflection point in the arc of Wegman’s scholarship quality. Or perhaps even represented a step change. Yes, although there were those earlier hints in 1996 and the colors classes. Of course, many papers and talks were *not* accessible, so we know what’s been found, but we don’t know what else might be out there. If one of my graduate students wrote a paper that referenced Wikipedia, I would laugh him/her out of my office. No serious scholar uses Wikipedia as a source. Wikipedia is categorically not appropriate as a source but it’s a darn good start into reading around a problem. Overall Wikipedia is an astonishingly positive achievement for humanity — it will probably take some years before this value is more generally recognised. Used in the right way, it can be an effective training ground for scholars to learn to check and verify everything by recourse to primary sources. In this regard Wikipedia’s obvious “amateur” characteristics are a strength. They are a constant caveat and remind the scholar it is their responsibility to do their own checking. This point may be lost on the student who defers to more authoritative texts. Right, but I would expect my graduate students to contribute to pages, adding to the knowledge base, instead of using them as a source. They are useful for a quick look at a topic, or perhaps to find a reference to a seminal paper in a particular area, but Wikipedia pages are not original, peer-reviewed literature, and as such, are absolutely inappropriate to cite as sources of knowledge or background. The fact that Wegman plagiarized Wikipedia, let alone referenced them, speaks volumes as to the quality of his scholarship. That should be: …so-called scholarship. b) Avoiding the “citation explosion” that can happen otherwise. Sometimes Wikpedia is a decent introduction that avoids having to cite 5-10 of the references it cites. But Rob is certainly right for serious scholarship on a topic. We have various awards — Lord Monckton’s Nobe or the Darwin Award come to mind. I wonder if we should have one for outstanding plagarisim? Perhaps some organization could award an annual Taisner award to some deserving plagiarist each year. BTW the irony was that Taisner published an uncorrected version of the book and was criticised for bad science — Benedetti had realised his error and issued a new printing of his book. Shades of not understanding the subject that we see in the Wegman story. Suggest it to RetractionWatch folks. Librarians tend to take this sort of stuff very seriously. Perhaps an opportunity to make waves? Apologies for a long post. I drafted out the following form letter, which you would be welcome to take up and use ad lib. I feel quite diffident putting this forward, in light of the massive work that has gone before. But I have been getting quite a bit of practice recently writing stern letters! It has been alleged that the publishing house Wiley engaged in “coverup” of a case of plagiarism by two Editors of the journal Wiley Interdisciplinary Reviews: Computational Statistics (WIREs CS). Please see Deep Climate, and John Mashey’s blog [1, 2, 3, 4]. The alleged perpetrators, Edward Wegman and Yasmin Said from George Mason University, had previously been accused of plagiarism in earlier work that cast doubt on anthropogenic climate change , and indeed had one of their papers retracted . Plagiarism is a serious academic offense. The finding that plagiarism would be committed by the Editors of a Journal, and peer-reviewed and accepted by another Editor of the journal, is altogether worse. When this is further compounded by an apparent attempt to rewrite the published record on the part of the publishing house, the whole system of academic quality assurance is thrown into doubt. As readers and contributors to [insert Wiley Journal name here], we seek your assurance as to the robustness of the journal’s systems for addressing academic misbehaviour. In this case the alleged plagiarists happen to be noted climate change critics. Similar to the historical mis-dealings of the tobacco industry , this case appears to be further evidence of the corrosive effects of climate change denial on intellectual discourse. We look forward to your early response and assurance that such misconduct will not be tolerated at [insert Wiley Journal name here]. Wegman EJ, Scott DW, Said YH, 2006. Ad-hoc Committee Report on the ‘Hockey Stick’ Global Climate Reconstruction, “A Report to Chairman Barton, House Committee on Energy and Commerce and to Chairman Whitfield, House Subcommittee on Oversight and Investigations: Paleoclimate Reconstruction.” Available at http://www.uoguelph.ca/~rmckitri/research/WegmanReport.pdf. accessed 17/03/2012. Said YH, Wegman EJ, Sharabati1 WK,Rigsby JT. RETRACTED: Social networks of author–coauthor relationships. Computational Statistics & Data Analysis. 2008, 52 (4) 2177–2184. Chapman S. Research from tobacco industry affiliated authors: need for particular vigilance. Tob Control. 2005 Aug;14(4):217-9. I’d say the analyses (which include side-by-side comparisons) would be compelling references. Sure, the links are in my piece, but they do form the core evidence of the two Wiley cases. (The two could simply be added to citations/refs 1 and 2). I guess those analyses would go in at or alongside reference . Also, my bad, it should say “insert Wiley journal name here” after “As readers and contributors to ,” and “will not be tolerated at .” I had put that text in angle brackets which obviously were interpreted as html code. I’ve updated your comment accordingly. It might be wroth revisiting pp.49-55 of SSWR to recall Wegman’s idea of peer review: ask a few friends for quick comments. Perhaps “external referees” meant DC and (TK or me)? You folks at Deep Climate have not posted a new topic in almost a month. No, although I have fallen off my blistering twice-a-month pace.